I went out to TMR this morning and came out with a pretty good haul. I travelled by bike, unlike the last few weeks when I went with a friend by car, and brought along my bike trailer. A friend also came along and helped carry some stuff. At one point a security guard stopped me and told me garbage picking was forbidden and to leave TMR. I felt disobedient, paying him lip service and continuing on my route. I didn’t think there was any truth to the claim and felt ready to discuss it with the real police if necessary. Regardless, we didn’t cross paths again. I came across this pile midway through my journey. It sat in front of a recently sold house. In my trailer you can see a somewhat busted learner’s guitar I had found a bit earlier. It’s a piece of junk but it’s fun to play around with. I pulled this odd wooden box by Kindermann and Co out of one of the bags. 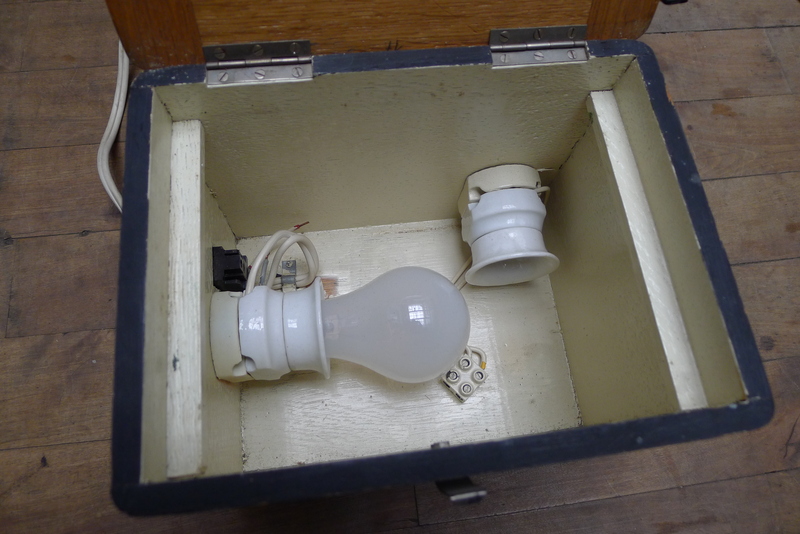 Inside are a couple of light fixtures. I didn’t find any reference to this online so I was hoping you could help me figure out what it is! Another picture is in the thumbnail below. I also found two of these teapots (?). The design is pretty unique, I’m thinking it might actually work pretty well. I kept one and left one where someone else might find it. The bags also contained a number of slides. The photos are not unique, they’re the kind you’d buy at souvenir shops back in the day. I thought it was pretty silly to buy slides that everyone would have. However, these were the pre-internet days and I could see serving as good memorabilia for someone who doesn’t like taking photos. 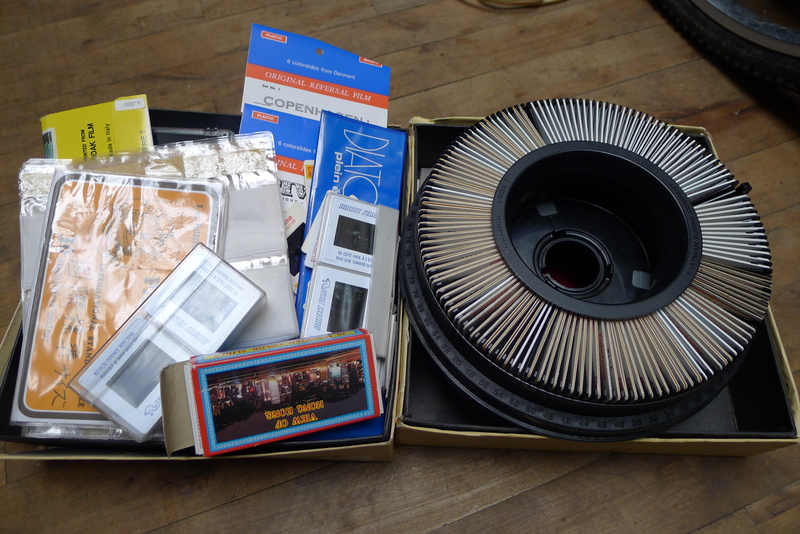 These slides are useless for my photography project but I bet someone might have an interest in them. Maybe I’ll put them up for free on craigslist. My best finds, however, came from this spot. I wish I remembered where it was (I always lose my bearing in TMR due to its winding streets), all I know is that it was around the north-west of the neighborhood. 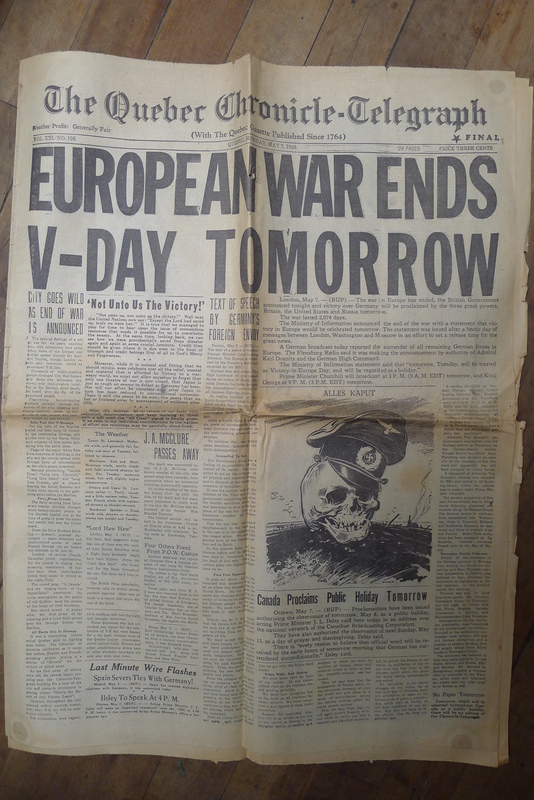 Inside the boxes were a bunch of old newspapers, most of which were published at the end of WWII. These are really interesting to look at. 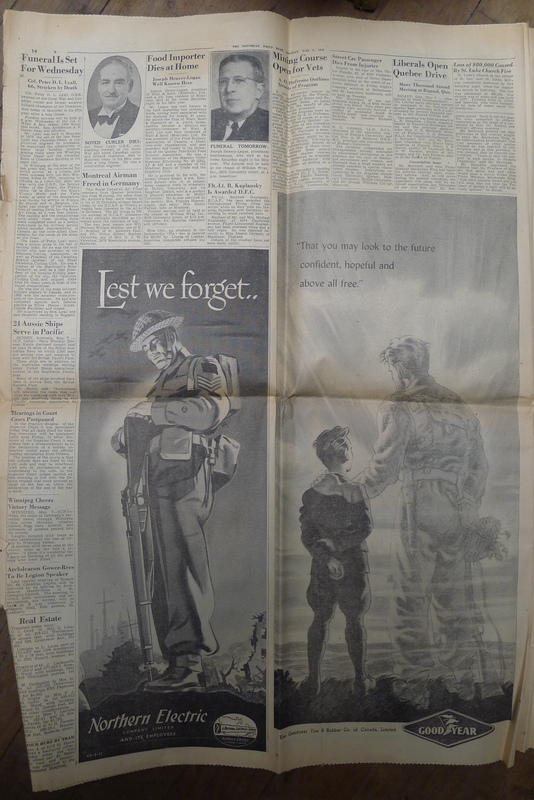 One thing I noted were the massive, beautiful ads specially designed for the end of the war. If this were to happen today I’d think of it as corporate pandering but I think these ads are a genuine expression of happiness. 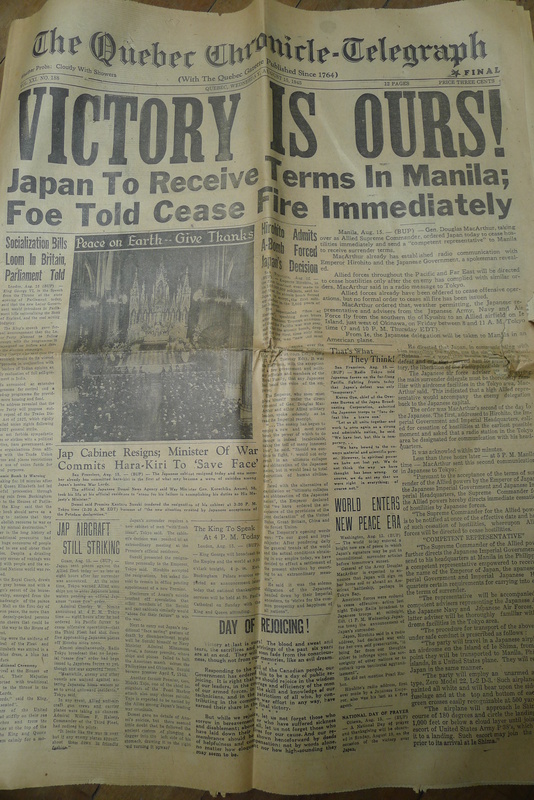 They are a symbol of exactly how mobilized the entire country (and world) was for this war. 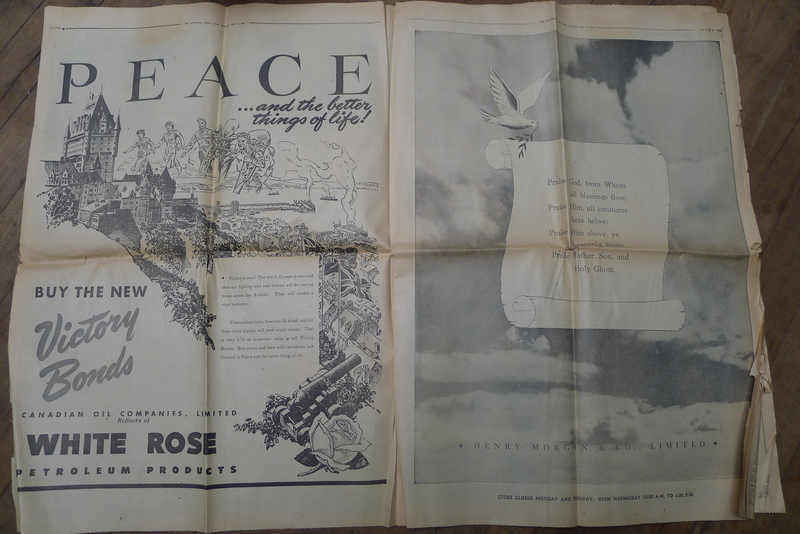 Another thing I noted were headlines proclaiming “peace for our time,” an optimism which looks pretty naive with retrospection. 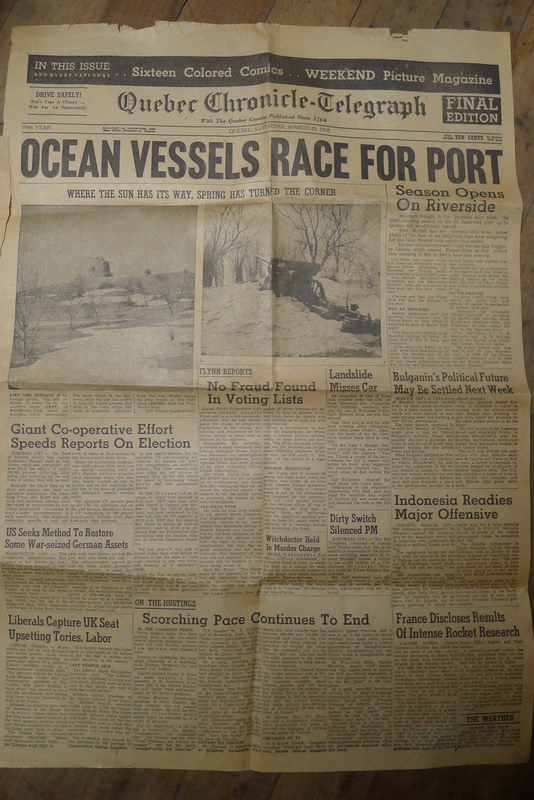 There’s also three Hebrew papers (1941, 1942, 1958) and two other incomplete English papers, one of which was published at the end of Expo 67. 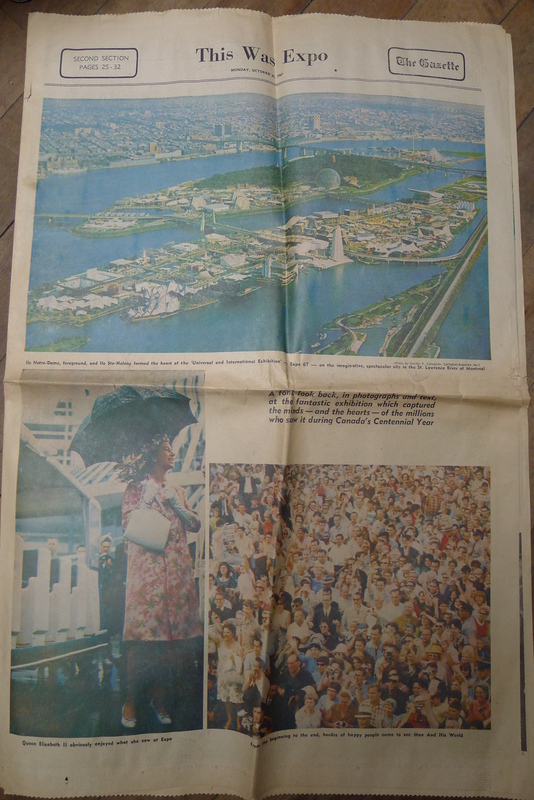 I think the fact that Expo 67 made it into this small collection goes to show how important the event was to Montreal. Check out the pictures in the gallery below. There were lots of old photos, some of which I took. 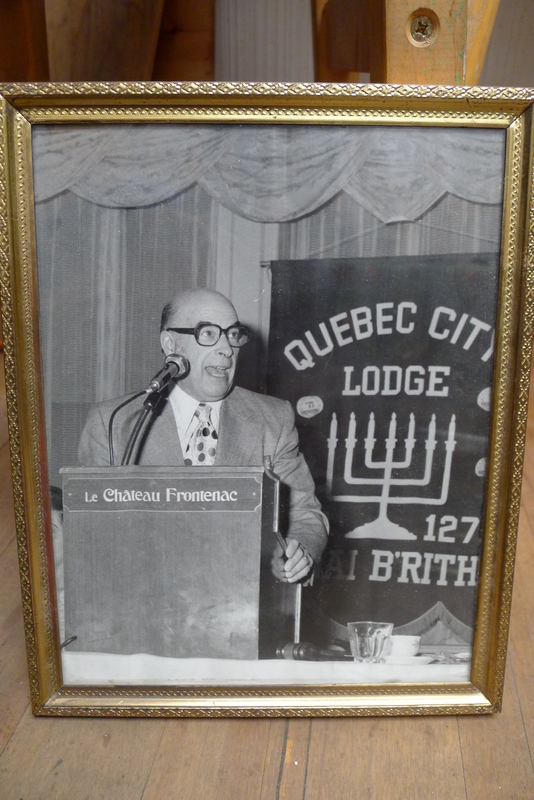 This one, featuring a speaker at a B’nai Brith (a Jewish Volunteer organization) lodge stuck out for whatever reason. I had the feeling that the speaker might be famous, though it’s quite likely that he’s not. I like this old portrait. 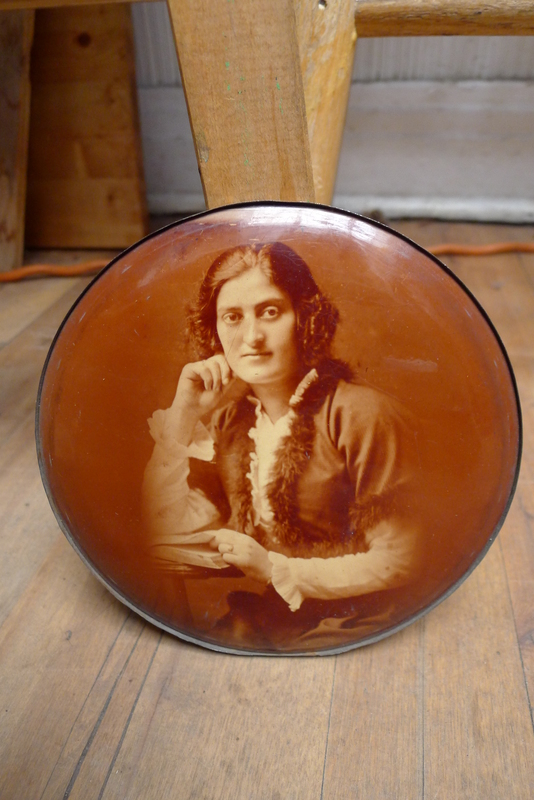 It was printed on some kind of metal (or perhaps plastic) by a Columbia Portraits Co out of Chicago. Another old photo. It looks to be the same person. There’s a bunch of Hebrew writing on the back. 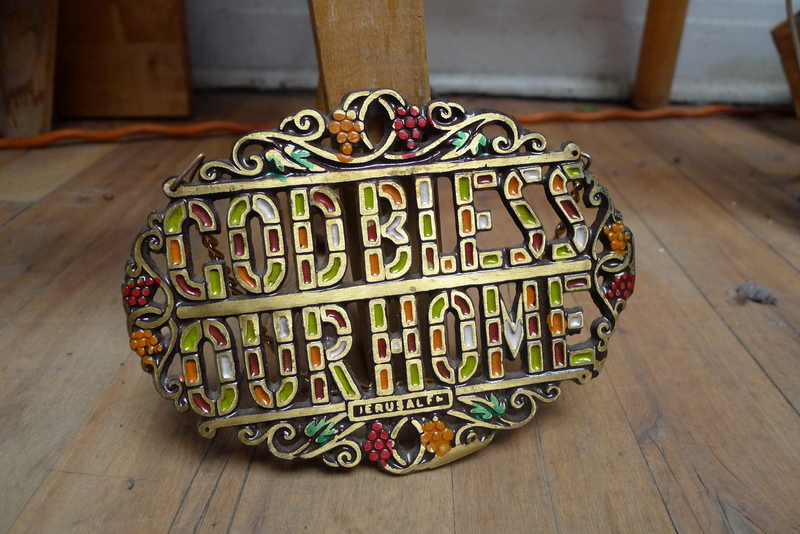 This is the Jewish version of the kind of trinkets my Grandpa used to like so much. It’s actually a pretty nice design. 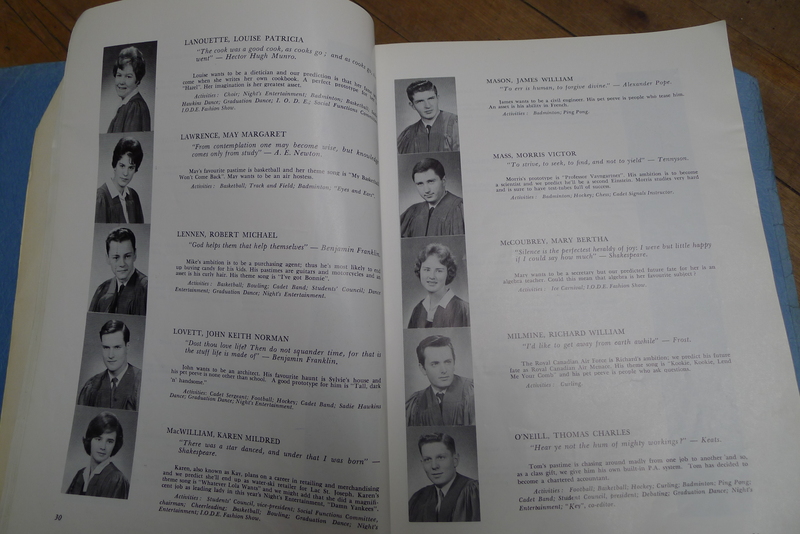 I just posted photos of an old 1960s yearbook in my last post. 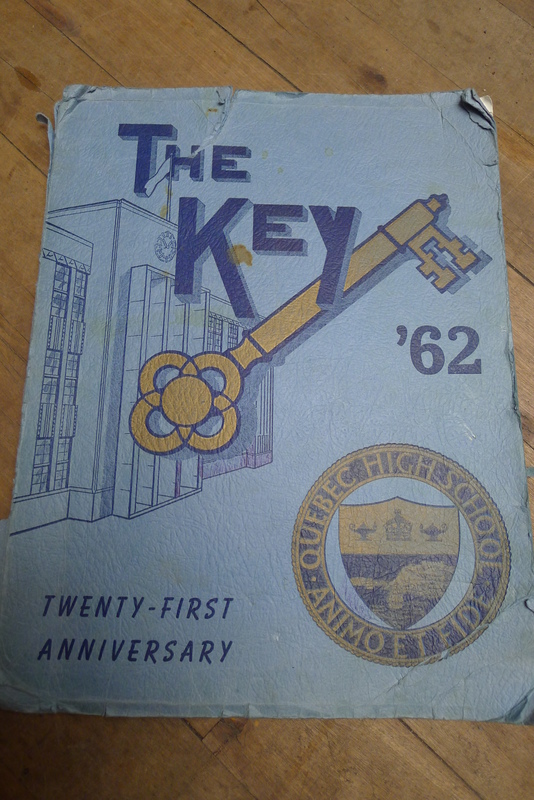 Here’s another one, a 1962 yearbook from Quebec High School in Quebec City. The teachers here were “normal,” not nuns like at the last school. I’m going to poke through this a bit later, but it’s always fun to read through the old student profiles. A few of those are in the thumbnail below. 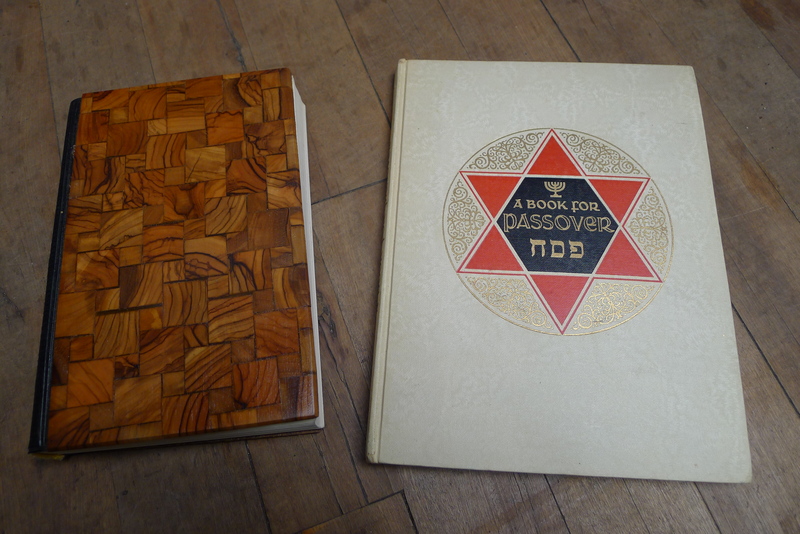 Here’s a 1967 wood-covered copy of the Tora and a 1937 kids book about Passover. Both are in good shape, the Passover book remarkably so. 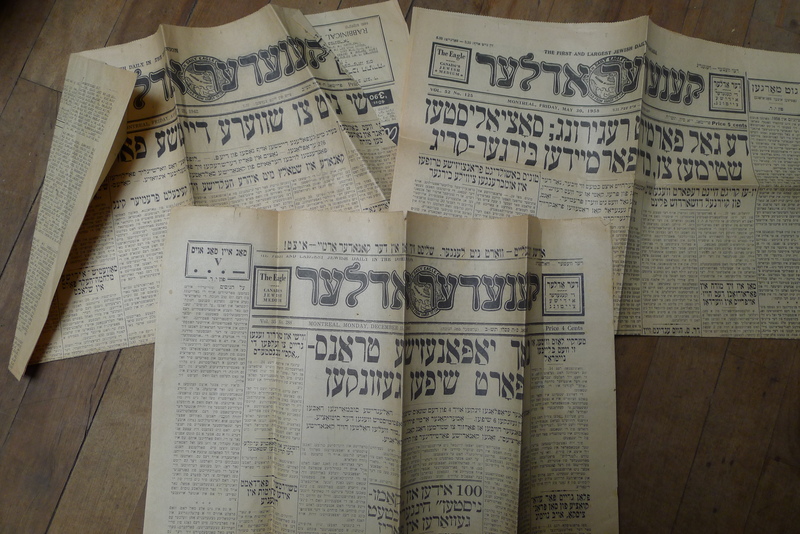 I realize now that I displayed the Tora the wrong way, Hebrew texts are printed in the opposite direction. 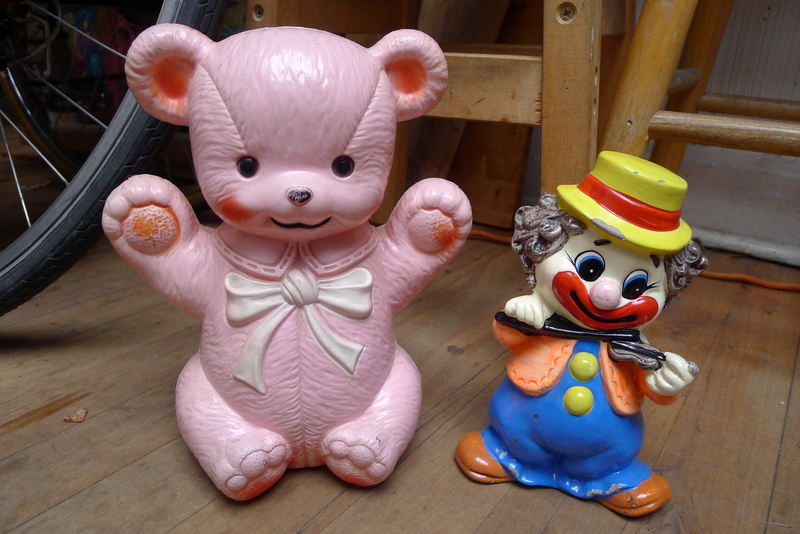 These are old coin banks. The left is made by Regal Toys and is made out of plastic. The other is porcelain but I don’t see any makers marks. As clowns go this one’s pretty charming. 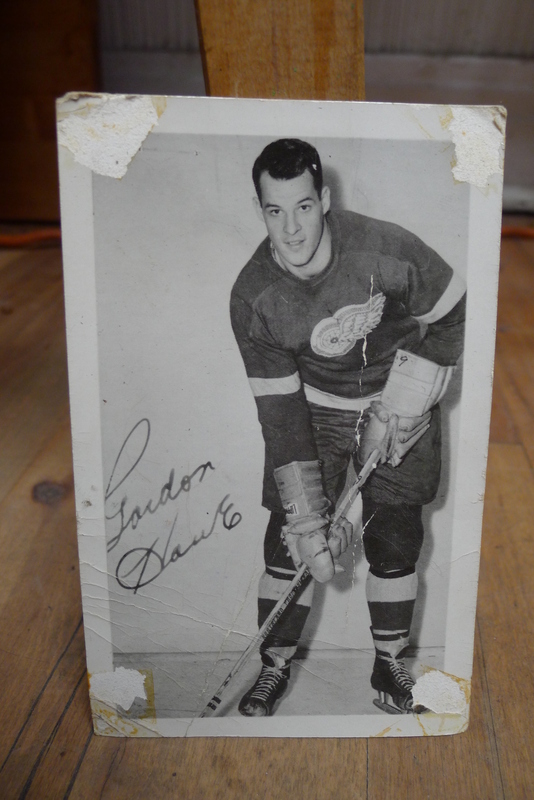 Last but not least is this old postcard featuring an hockey player that I think is Gordie Howe. 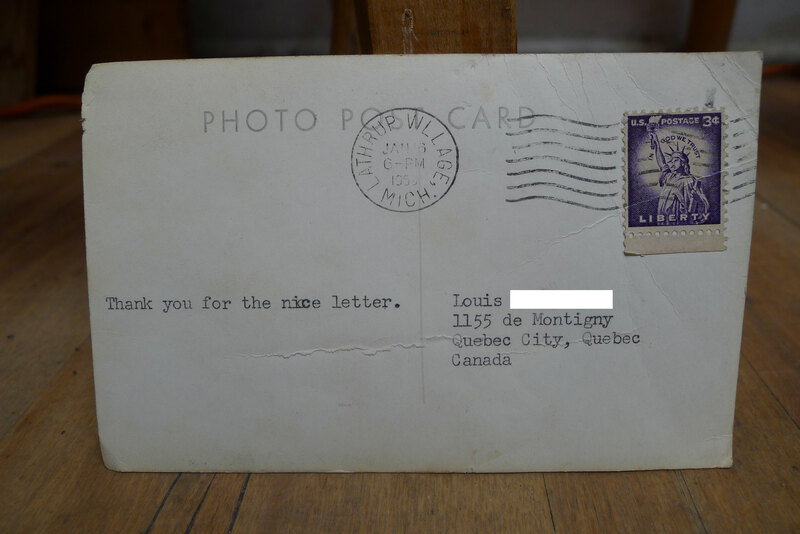 What’s interesting is the message on the back, “Thank you for the nice letter,” which was typed using a typewriter. It’s possible that Gordie himself typed this brief message, though it’s also possible that he had someone else responding to his letters. Since there’s no proof that Gordie ever touched this it’s probably not worth much. There’s also a marks on the front corners, probably from being taped to a wall. It’s still pretty cool though. I’m glad I ignored the security guard, otherwise this stuff likely would have been lost forever. I acknowledge, though, that I’m privileged before the law as a clean cut white guy. If I were part of a different social group or had a mental illness things like this would be much harder to get away with. The usual route for tomorrow is Outremont and Rosemont. However, I’m feeling adventurous and want to explore some new places. Maybe I can find a route to do in Cote des Neiges or Ahuntsic. I have some research to do! that “teapot”, don’t know, but I have the idea I saw this on some antique show, and it is not a teapot. hard to tell but is one of those “spouts” sort of perforated? that Torah with the wood cover…..is that an original wood cover, so to speak came with, or do you think someone just put the wood on? seems to me if it is original it might be unique “ish”? must be someone / synagogue you can check? I feel so sad about picture/photos tossed in garbage. 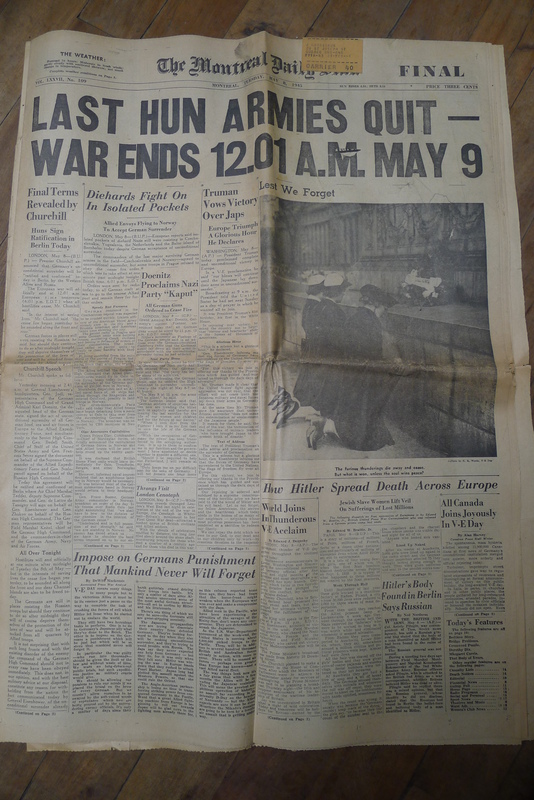 I am really awestruck by the great finds of historic newspapers and trinkets in the trash.The trinket ‘God Bless Our Home’is very good.I hope you took it.I also loved those two coin banks and hope you rescued them too.The photos were great too and your friend should have helped you rescue all of them.Not too many people scavenge in TMR,hence you should scavenge more often there.There is a lot of good stuff to be found.SCavenging is not really ilegal.I found people scavenging in Verdun West in the trash of a wealthy house right before a parked police car.The cops did not say anything.I by the way,,like Lynn,too feel very bad someone tossed great photos in the garbage. Is there a pottery/maker’s mark on that hand-thrown teapot? 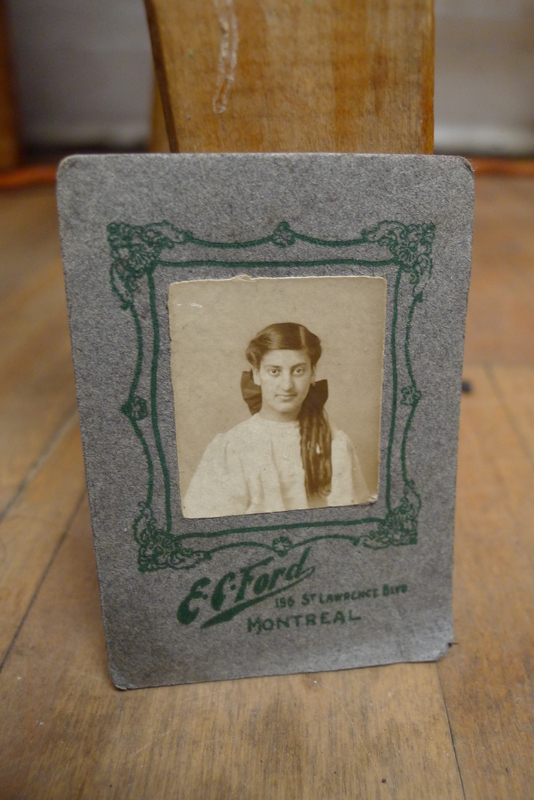 Great photos and interesting ephemera! This looks like the exact one! It has the same mark on the handle. Thanks for the research! 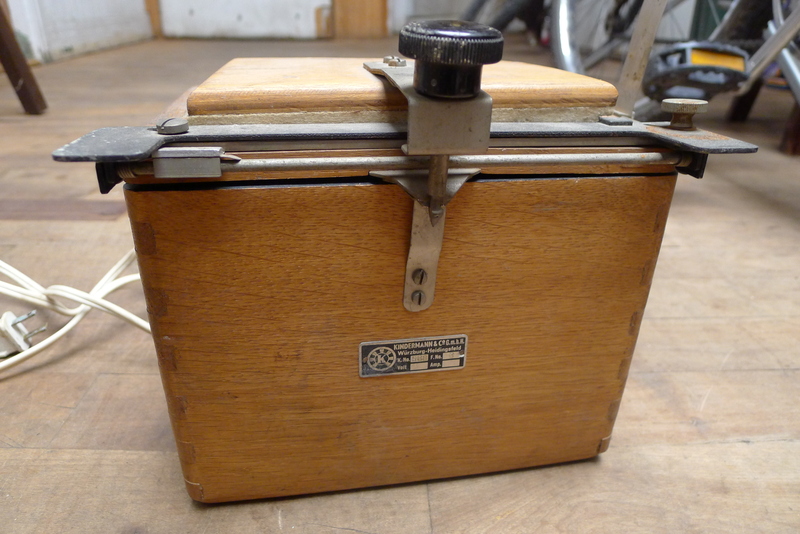 Does the wooden box have a translucent panel on top, maybe a lightbox for viewing slides? x-rays? the kindermann name is associated with slide prjectors/photography. 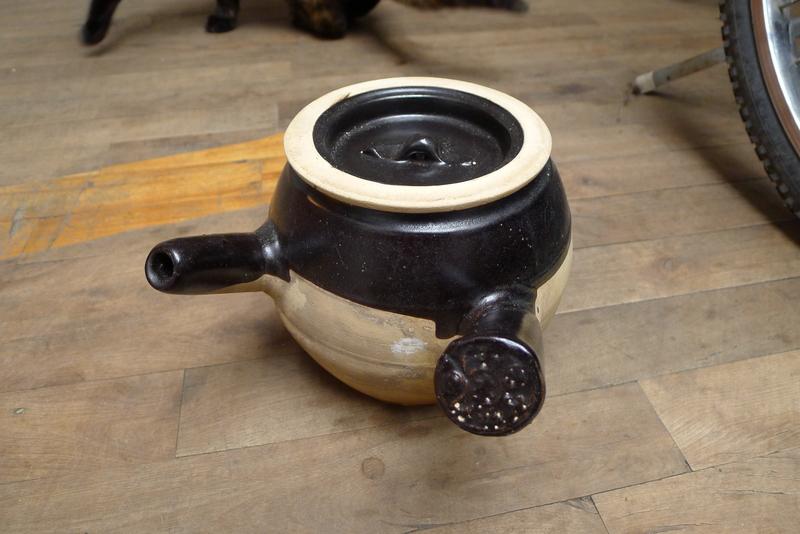 Medicine pot … how interesting! What a cool haul! 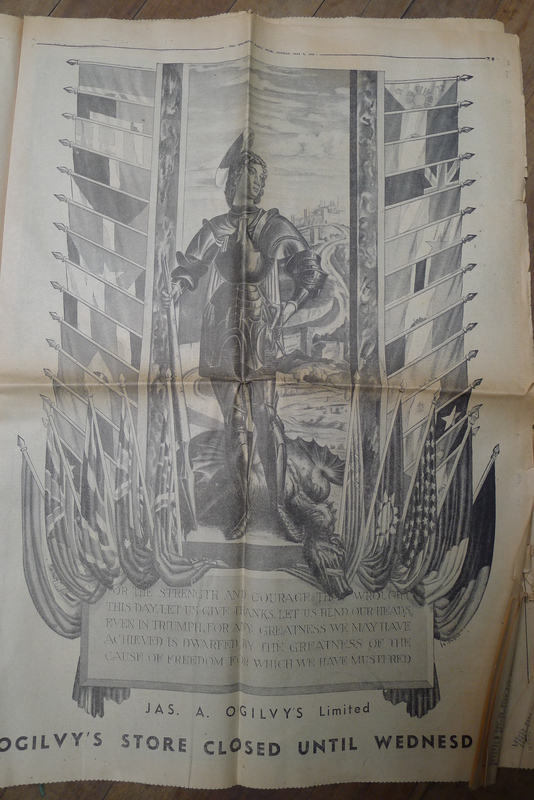 I love the old ephemera and photos. How long are you going to keep at the collecting? Until it snows? Me too. I’m going to keep at it through the winter, I might just take more time off, especially if there’s cold rain or a snow storm. I’ll spend the time learning some skills, maybe the guitar. I can’t resist the allure of garbage! I was wondering about winter! I live about an hour south of Montreal, in New York, and can’t quite imagine you sorting through garbage bags in the weather I know we’ll get! Glad to hear you’re going to stick with it as much as possible, though! you know, I am glad to hear you will continue through winter..
this is assuming that you do have “competition”, that is folks who may get there ahead of you? try going out on morning when there is sudden bad weather/sudden cold snap. especially if the days prior have been fairly nice. reason for days ahead better to have been nice, is then folks will have put their garbage/etc out. 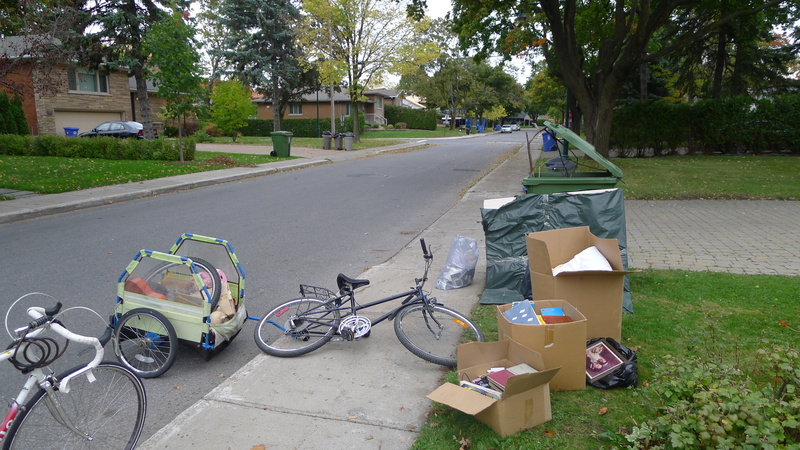 if it is down and out miserable, mostly folks likely to leave garbage till next week. reason to go out in sudden bad weather/sudden cold snap, is likely no one else will be out. I take my bottle returns to a very busy bottle depot. I used to really hate it, as the line could be hours long. now I wait until sudden bad weather, when I wake up. load up the bottles and “run”..Usually get in right away or in minutes. Everyone else stays home. That’s a good idea. Winter in general reduces the competition to pretty much zero. It also means I get to work in peace as people tend to stay in their homes instead of sitting on the balcony, work in their yard, etc. I don’t mind biking in the winter, you just have to wear good clothes to stay warm. I’ll likely focus more on covering richer neighbourhoods. 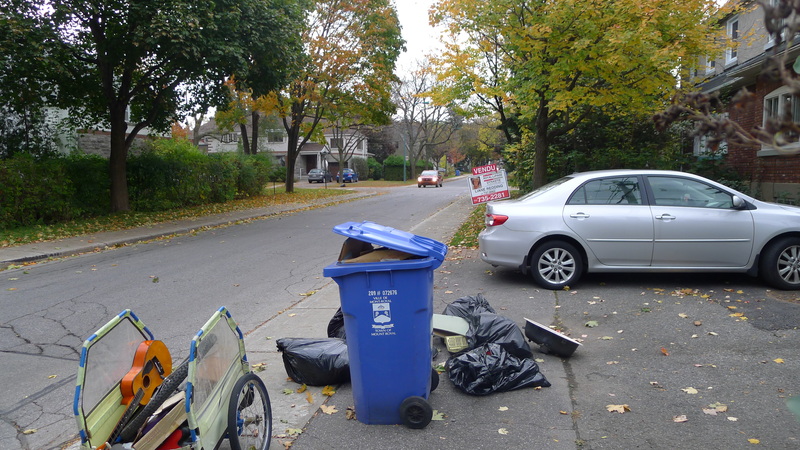 Glad you will be continuing to trash-pick in winter.If you are going to trash-pick in the north,choose Gouin boulevard all along Ahuntsic and Cartierville.Gouin in Ahuntsic/Cartierville is lined with many,many wealthy homes and luxury mansions.Also try Prieur street in Ahuntsic.Even doing Gouin street in Pierrefonds/Roxboro on garbage and recycling pick-up day might yield many treasures.There is a great biking trail besides Gouin;it is beautiful biking there on mild autumn days. The Kinderman is a contact printer. You put your b&w negative in contact with a sheet of light sensitive photographic paper. Expose it for the correct amount of time with the lights and develop it. The end result is a photographic print the same size as the negative. Super finds in TMR for you.I am glad you did not allow the security guard to scare you away from the neighborhood.I was walking in Ville Emard last Friday morning and I happened to see a wad of Canadian Tire money sticking out of a recycling bin.I rescued the Canadian Tire money.I have found discarded Canadian Tire three or four times before serendipitously in downtown and the Southwest borough .By saving up Canadian Tire money,I hope to buy myself a small gift at Canadian Tire.Apparently a number of people seem to throw out Canadian Tire money–I cannot understand why people throw out useful things like Canadian Tire money,photographs and jewelry.These things do not even take up space.If you find Canadian Tire money like me ,please write on your blog.I am delighted to read about your enthusiasm in foraging. Glad you could save it. I’ve seen it before but never in a significant amount… I’m sure I’ll find some more some day, I’ll let you know if I do! I collect cans and bottles in Lachine,LaSalle and Dorval from time to time to supplement my income .I know that on rainy days,stormy days and very cold days,I collect a lot more bottles and cans because there is less competition.Fewer scavengers venture out in bad weather,even area residents who occasionally forage to satisfy their curiosity seem to not poke into the trash or recycling bins when the weather is bad.Besides cans,I also bring home working appliances,wall posters,dolls and small pieces of furniture occasionally.In bad weather too some people always scavenge,but a lot fewer— hence these few people have a greater duty to rescue discarded gems before they end up in the garbage truck.Please do cover richer areas and continue your mission in winter.You can also work a part-time job one or two days a week if need be—but do not abandon your blog.You have more than 1,00,000 hits to your blog.Very impressive indeed. I was reading your fascinating blog and your past blog posts.Almost all the reader comments are positive.However,I remember once a lady screamed at you while you were foraging and asked you to get a job and to leave.Fortunately,such encounters are rare.Do you get any hate mail on your private email account discouraging you from hunting through garbage?Considering how positive your work is for the environment,I hope you get very little hate mail.Curious to know.Wish you the best in months to come.